Guides that Work Hard and have Fun Period. Outfitter/Owner and Head Fly Fishing Guide at MDO. Fly fishing has been an obsession for the last 18 years. Guiding clients on beautiful water and catching beautiful trout is what it's about. Grew up in Missouri, chasing smallies and running jet boats. Brock and Ashley have 2 kids, Finn and Mo. When he is not out guiding clients he is spending time with the family, likely in pursuit of trout. From Texas, that's about all you need to know. Well and that he still hasn't sent me his bio. Don't let that fool you though. Mitch is as "fishy" as they get. A day on the water with Mitch is full of BS and things that wiggle on the end of the fly rod. Oh and he will probably talk about his first child, Lucy, she is a black lab. Taylor doesn’t like to think that he found Montana, but rather that Montana found him. Within hours of arriving, sight unseen, to Craig for his first fishing industry job, he knew the Missouri River would be the place for him. Nearly half a decade later he is pulling on the oars as a full time guide and fishing every day he has off. Taylor loves guiding all anglers with any skill level and makes it a goal every day to teach something new to everyone in his boat. Whether it’s a first fish on a fly rod or spending time learning a technical cast to a weary trout, time on the water cherishing these moments are what keep his passion for guiding alive. Hailing from the great Northwest, Bryce grew up exploring the outdoors from an early age. A childhood trip to Missoula was all it took for him to realize his true calling. Bryce enjoys the pursuit of all things wild. Bottomless patience and contagious smile round out his in depth knowledge of trout and the places they call home. 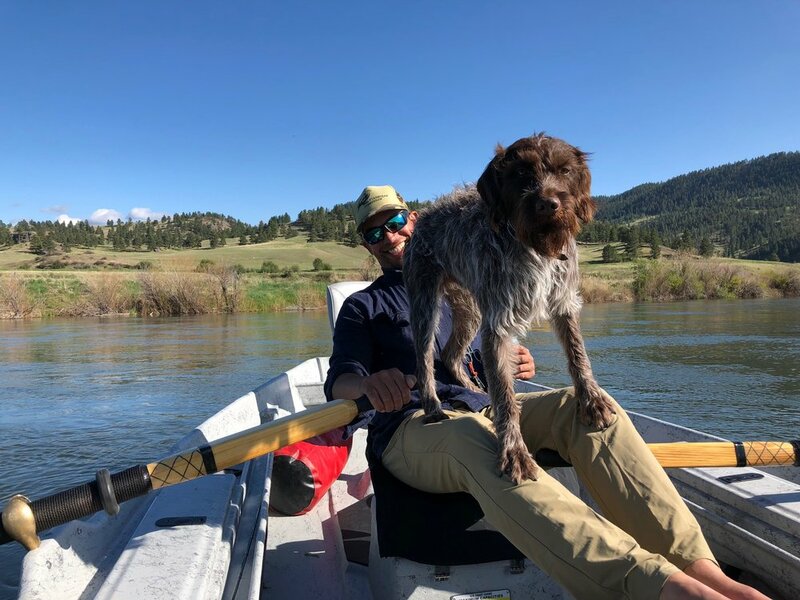 When not rowing the rivers and streams of Montana, you'll find him working his string of bird dogs on grouse and partridge.